Ohio's Republican Gov. John Kasich and Colorado's Democratic Gov. John Hickenlooper returned to Washington this week with a healthcare blueprint to address health costs, this time touting more value-based care to lower costs and transparency in drug pricing. Kasich and Hickenlooper became vocal advocates for a two-party approach last year when congressional Republicans undertook to repeal the Affordable Care Act, and spoke to a Washington audience as the National Governors Association's annual meeting kicked off. This year Gov. Bill Walker, the Independent from Alaska, joined them. Their seven-page blueprint focused on stabilizing the individual market, regulatory relief, greater shift away from fee-for-service care and incentives for providers and pharmaceutical companies to do more with less money. But their immediate asks of Congress are essentially to fund cost-sharing reduction payments, Kasich said. Kasich said he urged President Donald Trump in a phone call this week to allow negotiations for drugs in the Medicaid drug rebate program or let state programs kick the drugs off their formularies. "What do we want in Ohio? We want leverage," Kasich said. "If somebody will not negotiate lower prices for Medicaid, we want to be able to kick them off our formulary. That will get their attention." Kasich said, however, that negotiation is key to bring drug prices down. Kasich also said he wants more authority to tailor his Medicaid program, a policy advocated by CMS Administrator Seema Verma. 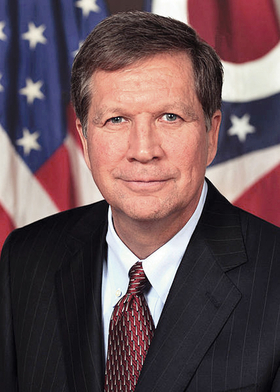 Kasich also defended his state legislature's request for a Medicaid work requirement waiver. "Reasonable work requirements are fine with me, it just has to be thought of in a way that makes sense," Kasich said. States should also be able to tweak the ACA's essential health benefits, he added. "It's like healthcare doesn't even matter anymore," Kasich said. Govs. Tom Wolf (D-Pa.) and Brian Sandoval (R-Nevada) also co-authored the blueprint.